You get to be the designer of your custom cookie gift. 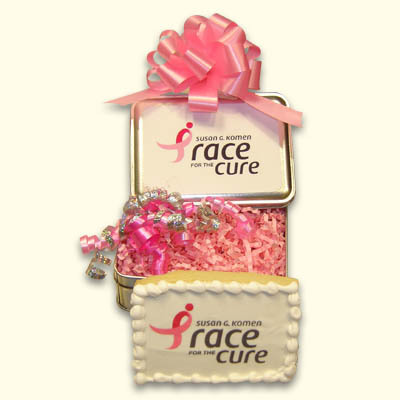 Order this custom gift and incorporate your logo or personal messageon the center cookie, with 4 matching themed cookies around it. Each cookie tin is finished with your logo or our Wonderland Bakery artwork on the outside of the tin, and wrapped in cellophane with a matching bow. A distincitive and personal gift for any occasion or celebration. Other cookie shapes available. Contact our Corporate Gifting department at Info@WonderlandBakery.com for your custom request.